The Jubilee Players are hoping to put on another pantomime in 2019 and are recruiting new actors to join them. They are holding their AGM on Wednesday 2 May, 7.30 p.m., at the village hall (Social Club room), and if you are interested, you are welcome to come.Otherwise phone their secretary Peter Jeffery (01953 789687) or email via crjubileehall@gmail.com and your message will be passed on. Mother Goose was performed in February 2018 to the usual acclaim. There were plenty of hoary old jokes and plenty of hoary old villains, together with some dodgy animals and doubtful plot twists. In July 2017, the Jubilee Players headed for the great outdoors to perform some comic sketches and minidramas. 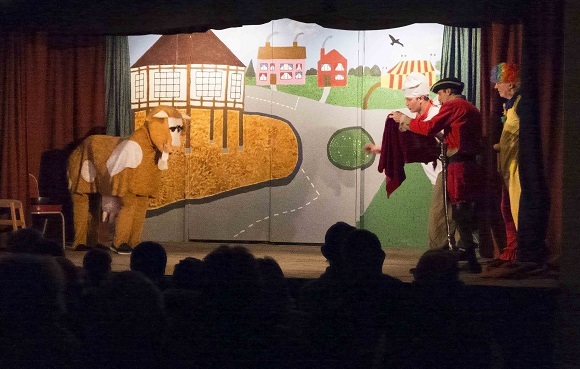 The Carleton Rode Jubilee Hall Players' pantomime for February 2017 was one of England's favourite traditional panto tales, 'Babes in the Wood'. Employing the usual mix of groan-inducing bad jokes, slapstick comedy, jolly songs and non-stop puns - plus an unusual quantity of outrageous cackling - the action featured an odd mix of characters - a wicked villain or two, a dismal jester, a clumsy juggler, a bumbling dame, the Sheriff's incompetent sidekicks, the lovely babes of course, and, perhaps unexpectedly, some exotic Egyptian sand-dancers. Carleton Rode Jubilee Players were formed after staging their first pantomime ‘Red Riding Boots’ in 1994, and they have performed a February pantomime just about every year since. They have also put on performances of variety shows, old time music hall shows and plays with the emphasis very much on having fun for both audience and cast. The Players usually begin their panto rehearsals at the village hall in November. Then, hopefully, everything comes together for four performances during the February half-term week.The Players are always ready to welcome new members to take part either on stage or helping with the many back stage tasks. And don’t let age be a barrier – we have members from teenagers to well into their 70s. If you are interested contact the secretary, Mr. P. Jeffery, Old Schoolhouse, Church Road, Carleton Rode, tel 01953 789687 or treasurer, Mr. M. May, Haddeston, Church Lane, Bunwell, tel 01953 789511. Jack and the Beanstalk was performed in February 2015. Cinderella was performed in February 2016.